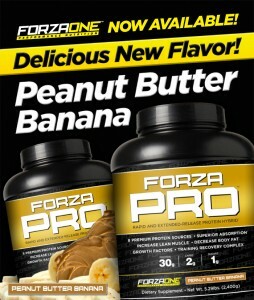 Forza Pro Peanut Butter Banana Flavor! – Nutrishop Tampa Nutrishop Tampa is a great place to get supplements and vitamins, order by telephone 813-991-9999 today! Forza Pro has just made a new flavor of protein, Peanut Butter Banana. This rich and flavorful flavor is now available at Nutrishop Tampa. However, this new flavor is unique to the Forza Pro Complex. Order your Peanut Butter Banana Flavored Protein at Nutrishop Tampa. This exclusive protein and protein flavor cannot be found elsewhere. Call 813-991-9999 today to order your supply of some of the best protein on the market.